I am a Senior Lecturer in the Department of Mathematical Sciences and co-director of the Centre for Mathematical Biology at the University of Bath. I am also the department’s widening participation, outreach and engagement officer. Fellow of the Institute for Mathematics and its Applications FIMA. Member of the Society for Mathematical Biology. Member of the London Mathematical Society. 2017 – Mathematics staff award for best teaching of an applied module. 2016 – London Mathematical Society celebrating new appointments grant. Giving my winning presentation at 2016’s Engage event. 2016 – Winner of the University of Bath Vice-Chancellor’s Award for Public Engagement with Research (see picture, above). Read more about the event here and watch my talk here. 2016 – BBSRC STARS grant for the REP-MB (Research experience placements in Mathematical Biology) programme. 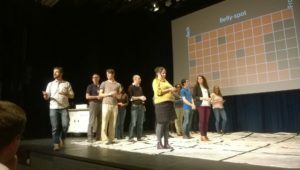 12 Mathematical Biology Summer internships spread over 3 years. 2015 – LMS research in pairs grant. 2015 – Runner up in the University of Bath Vice-Chancellor’s Award for Public Engagement with Research. 2014 – Silver award in the Mathematics section of the national ‘SET for Britain’ poster competition (see picture, below). 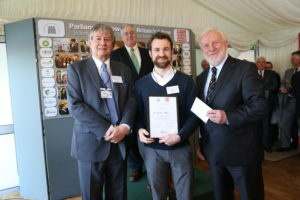 Receiving the Silver award From Sir Adrian Smith (left) and the right Honourabe Andrew Smith MP (Right) with Stephen Benn (background). 2013 – Nuffield/LMS Undergraduate Research Grant. Stipend for undergraduate student to work on an 8 week modelling project. 2013 – Poster prize at the European Society for Pigment Cell Research. 2013 – The Distinguished Old Waconian (Young Alumnus) Award (for services to mathematical outreach). 2012 – ESMTB Reinhart-Heinrich Doctoral Thesis Award (runner up). 2009-2011 – Leathersellers’ Scholarship (St Catherine’s College) – For academic achievement. 2009 – SIAM Student Travel Award – $650 – To present a paper at a SIAM conference on dynamical systems in Utah, USA. 2009 – Worcester College Academic Travel Grant – £300 – For the above conference. 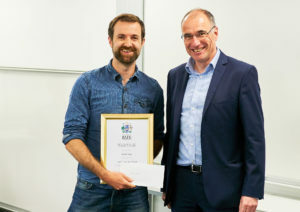 2008 – Inaugural Microsoft Research European Science Initiative Award – For the best short project in the Systems Biology Doctoral Training Centre, Oxford. 2007 – The Nuclear Electric Prize – For attaining the highest marks in the year in the Mathematical Modelling and Scientific Computing MSc, Oxford. 2006 – Mary Somerville Prize – For obtaining a first in mathematics finals. I completed my DPhil in Mathematical/Systems Biology in October 2011 under the supervision of Professor Philip Maini, Dr Ruth Baker and Dr Radek Erban. I was the first graduate of the Systems Biology Doctoral Training Centre. I then spent 3 years as a Junior Research Fellow at Christ Church, Oxford, based day-to-day at the Wolfson Centre for Mathematical Biology, which is part of the Mathematical Institute at the University of Oxford. I am also an alumnus of the 2020 science programme.